Director Steve McQueen and actor Chiwetel Ejiofor won awards from the Boston Society of Film Critics. 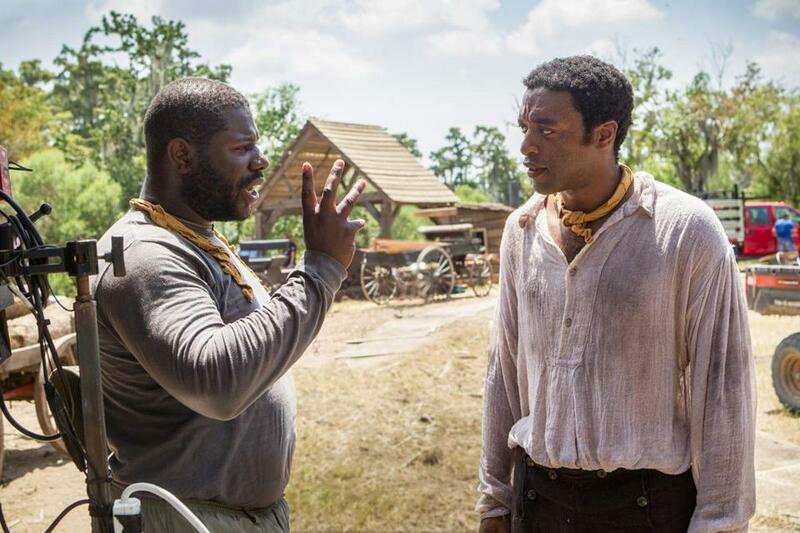 The gripping historical drama “12 Years a Slave” and the man who made it, British artist-turned-filmmaker Steve McQueen, were named best film and best director of 2013 by the Boston Society of Film Critics Sunday. “Slave” also won a best actor award for Chiwetel Ejiofor’s performance as Solomon Northup, upon whose 1853 memoirs of kidnapping and enslavement the movie is based. Cate Blanchett was named best actress for her role as a disturbed socialite in Woody Allen’s “Blue Jasmine,” a performance the Boston critics found so compelling that Judi Dench in “Philomena” was a distant runner-up. The BSFC is made up of 21 film critics in the New England area; 2013 marks the organization’s 33d annual awards. Reflecting an unusually strong year for fiction films, documentaries, and performances, the awards were spread around liberally. The late James Gandolfini won best supporting actor for his penultimate film performance in “Enough Said,” an honor as fond as it was deserved. (Two actors tied for second place in the category: Barkhad Abdi in “Captain Phillips” and Jared Leto in “Dallas Buyers Club.”) “Enough Said” also won best screenplay for director Nicole Holofcener’s script. Alexander Payne’s road movie “Nebraska” was the only film besides “12 Years a Slave” and “Enough Said” to win more than one award from the Boston critics, with best supporting actress going to June Squibb as the feisty spouse of Bruce Dern’s character and the entire cast getting a best ensemble award. Lupita Nyong’o, as the tragic field slave Patsy in “12 Years a Slave,” was a runner-up in the supporting actress category. In an unusually close vote, Josh Oppenheimer’s “The Act of Killing,” in which aging leaders of Indonesian death squads reenact their crimes, was named best documentary over “Blackfish,” a much-discussed expose of the treatment of captive killer whales. The animation race was even tighter, with Hayao Miyazaki’s “The Wind Rises” narrowly prevailing over Disney’s “Frozen” in a year widely seen as weak for animation. T Bone Burnett’s rich mix of folk music old and new in the Coen brothers’ “Inside Llewyn Davis” took best use of music in a film. “Wadjda,” the first film shot entirely in Saudi Arabia and the first made by a female Saudi director (Haifaa Al-Mansour), was named best foreign-language film. While “12 Years a Slave” was the Boston critics’ favorite, the vote might have turned out differently if more of the group’s members had been able to see Martin Scorsese’s “The Wolf of Wall Street,” in which Leonardo DiCaprio plays a bad boy of the 1990s financial industry. “Wolf,” which arrives in theaters Christmas Day, was in the cutting room until very recently and Paramount has scrambled to get the movie seen by major critics groups before their end-of-year meetings. The sole Boston screening came too late for many local reviewers to attend, and “Wolf” came in second to “12 Years” in the best picture, director, actor (DiCap-rio), screenplay, and editing categories. The voting was close — but close counts in horseshoes and hand grenades, not movie awards. The full list of winners can be found at www.bostonfilmcritics.org.